Brawlers are built to take the fight to the enemy. They can pin down one or more opponents with a variety of stuns and knockdowns, and can block most damage that’s aimed directly at them. A brawler’s skills are all about setting up combo attacks. Punches make Counter better, and every time she uses her skills, she builds up Rage...with which to unleash even greater attacks. With solid burst damage, heavy armor, and skills that can keep foes on the ropes, solo play with a brawler satisfies your taste for violence. The brawler can barrel through hordes of enemies and push them into a corner...or just away from the less-armored members of the party. Add that to her ability to draw foes in with a ground-shaking blow, or just a bone-chilling shout, and she’s got crowd control covered. With a well-timed Counter, the brawler can shrug off a lot of any boss’s damage, and still be ready to dish out some serious damage of her own. The brawler can use multiple Punches to wear down a target, then use the “super knockout punch” effect of Counter to knock the target down, setting up a High Kick. To remove targets from the fight and keep them pinned down, the brawler can Bull Rush through multiple targets, then deliver a Jackhammer to take them out of the fight entirely. If the brawler has enough Rage built up, she can also Rampage through the bunched-up enemies. The gunner is a solidly-armored, ranged dps class. Effective from every part of the battlefield, the gunner uses a variety of potent attacks to pound foes, including some fueled completely by Willpower. 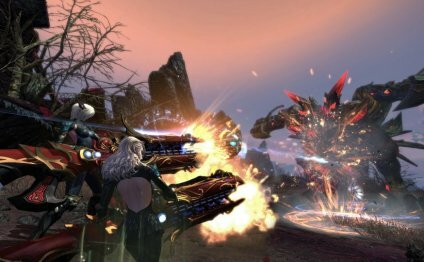 Gunner skills focus on dealing damage, in differing amounts and differing areas, rather than creating effects—although plenty of the gunner’s attacks stagger or knock back enemies! With high burst damage, heavy armor, summoned constructs, and skills that distance you from the foe, solo play as a gunner is a rewarding experience. When in a party, the gunner combines the roles of ranged dps (like the sorcerer) and crowd control (like the berserker). With her ability to both dish out and shrug off massive amounts of damage, a gunner is practically a boss’s natural enemy. Use Scattershot to get your target’s attention, then follow up with Rolling Reload to dodge any counterattack—while at the same time eliminating the cooldown on Scattershot for a second volley to finish them off. The HB construct does a lot of things, but one of the most spectacular happens when you use Arcane Barrage. Fire an energy pulse, then detonate it. Not only does it do a whole lot of damage, but your HB will launch a volley of bombs at the same spot. Lancer skills are adaptable to any party size, including an army of one. The lancer combines a large attack zone and high survivability to succeed in almost any situation. A lancer keeps the most powerful enemies focused on the most heavily armored character. Protect your allies by being the greatest threat in the group. Boss fights let the lancer take a position of prominence. However, your best defensive skills sacrifice damage in favor of protection so it's best to group up with other damage dealers. This leaping attack normally has a cast time, but will come up for an instant cast after Shield Bash, Shield Barrage, or a third consecutive hit from Combo Attack. These are three of your best skills, so you'll use Spring Attack in many situations. Not only does this skill set up a faster Spring Attack, but Shield Barrage combos with itself for a short stun effect! Tap or hold down the skill button to attack twice in a row. Mystics are a strong healing class with skills to protect and support their party. They also summon powerful thralls to assist and heal them in battle. Mystics’ skills prepare them for any situation, with a good balance of offense, defense, and support options. Summoned thralls and frontal AoE makes the mystic a solo powerhouse. With auras, crowd control, damage, heals, and debuffs, a mystic benefits any group. Mystics provide a diverse mix of heals, buffs, and DoTs during boss encounters. A channeled PBAoE spell that hits all targets in a range with a better than average crit chance. Deals variable damage, but after use allows the mystic to cast Infusion Ring, restoring MP based on damage dealt. Very useful fighting Bosses and BAMs. Extremely effective combo, since both spells cast quickly and deal superior damage to multiple targets. Better yet, it's available at level 6! Priest skills sustain a party through long and difficult encounters. A priest's fast attacks and survivability allow them to counter almost any situation. A priest's primary role in a group is to keep the party alive through healing and situational recovery skills. A skilled priest can quickly turn a disaster into a manageable situation. The use of Final Reprisal after these skills lowers its casting time. Shocking Implosion is for close fighting, Triple Nemesis for when you've got a little range. No matter how hard you try, sometimes the rest of the party just moves the wrong way, or not at all, and you've got to get one or more of them back on their feet. After a quick combat revival (or four), these rapid-fire blessings boost resistances, HP regen and movement, followed by a quick heal prepping them to run off and deal with all the aggro you just took for the team. Slayer skills are quick, precise strikes that knock over and incapacitate even the largest and strongest of foes, leaving them vulnerable for additional attacks. By focusing on knockdowns and stuns, a slayer can deal a lot of damage before an enemy knows they're even there. A slayer's role in a party is to deal huge damage while using evasive skills to avoid enemy attacks. A slayer's role in a boss encounter is launching counterattacks to interrupt and knock down opponents.